The day 86P and his wife returned from the south, they claimed this nest site. This was a terrific location for a nest. It was up on a fairly tall mound of old grass and reeds with snow surrounding it. 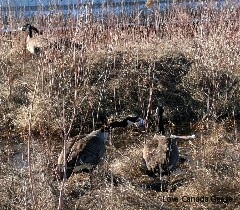 When the snow melted, it would turn the mound into an island, and their nest would be inaccessible to most predators. Well, the 86Ps didn't exactly place a flag or a marker upon their nest site to declare to the world that it was theirs so a few days later, another Canada goose couple claimed it as theirs. Mrs. 86P protested when she saw them standing on her real estate. In the photo above, she informs 86P in no uncertain terms that she intends to shove the intruders off her land. He agrees, as you can see, joining her in their declaration of war. Mrs. 86P leads the charge, with 86P honking his support for her. The nest site is hers, after all. The charge intensifies with increasingly louder honks as the 86Ps drive toward the base of the mound. 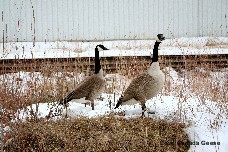 The intruders honk back in annoyance. "We're not leaving," they say. "This site belongs to us!" See the intruding couple on top of the mound? The 86Ps are almost there. 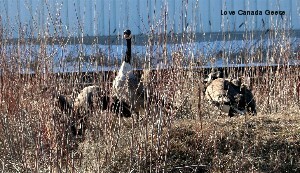 The area is filled with the sound of their noisy battle honks and growls. "Get off my land!" honks Mrs. 86P. "You'd better get off if you know what's good for you!" 86P adds. "We're not going anywhere!" replies the intruders. "Get off now!" Mrs. 86P insists. "Or you'll have hell to pay!" "I'm gonna beat you up!" yells 86P. "This is our site!" honks the intruders. "We're not leaving!" In her rage, Mrs. 86P becomes a ferocious fighter, toppling the intruding couple as soon as she arrives at the top of the mound. In the photo, she is enjoying a swift moment of victory as 86P charges at them. He's all prepared to fight for his wife's property. The 86Ps win! The nest site belongs to them! 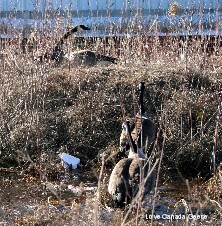 After a brief neck to neck battle with the intruding gander (it really was no contest! ), 86P rushes back to his wife, honking and making loud snoring sounds to proclaim his victory. He spread his wings in victory.